Men wade through flooded land in Bangladesh (above) while the aerial picture below shows flooding in Nepal. Climate change is widely acknowledged to 'load the dice' in favour of more extreme rainfall events, since warmer air can hold more moisture. 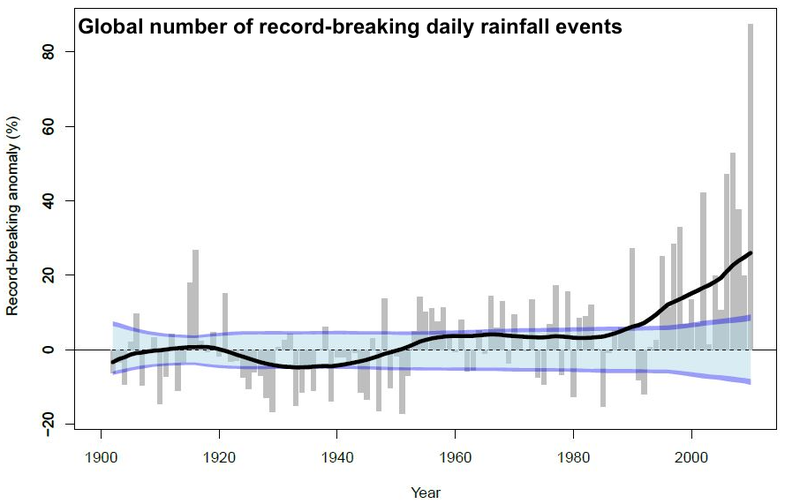 The graph below shows record-breaking rainfall events, consistent with rising temperatures (from here, original research summary here). In the long term, a move away from fossil fuels is the only solution. If you would like to donate today to help those affected, Save the Children have an emergency appeal.